After an introduction that examines Internet content syndication in general (its purpose, limitations, and traditions), this step-by-step guide tackles various RSS and Atom vocabularies, as well as techniques for applying syndication to problems beyond news feeds. 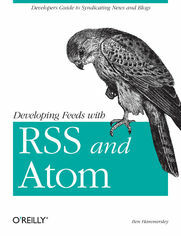 Most importantly, it gives you a firm handle on how to create your own feeds, and consume or combine other feeds.If you're interested in producing your own content feed, Developing Feeds with RSS and Atom is the one book you'll want in hand. 1.1. What Are RSS and Atom for? 1.3. Why Syndicate Your Content? 11.2.1. What Do We Know? 11.2.2. Can We Express This Data Already?